Since generations the mankind is busy by transporting water/sewer or any other liquids from one point to another point. The challenge was always to assure a conveyance system without fails and leakage. Most pipe failures were occurring on the joints through corrosion or cracks on the rigid inflexible pipe material. Over the last decades, the inherent weaknesses of concrete, clay, ductile, PVC and steel caused tremendous problems in existing water supply, sewer pipes systems, as they tend to be brittle or are too sensitive for aggressive chemicals and soil conditions. Leakages have become a common occurrence worldwide in water, sewer and other large diameter pipe applications. In addition, they have an unprofitable relationship between cost and benefit due to short life time and high maintenance costs. Krah Pipes are made out different grades of pure Polyethylene or Polypropylene who are providing superior properties against corrosion, leakage, pipe displacement and ex-infiltration. In addition to the permanent solution that lasts through generations, the Krah piping system is able to provide a sustainable, environment friendly and economical solution with its wide-ranging fields of applications, f.e. water supply, sewer systems, drainage, storm water management, sea outfalls/intake, manholes and reservoirs. In order to meet the demand of the at least 100 years leak free, sustainable and flexible pipe system, Krah Pipes are produced with an integrated electro fusion joint system, which assures a melting of the pipes to a homogenous and monolithic pipe system. Other materials can be used after prior acceptance of the producer and a third party for quality control. Krah Pipes are made from HD-PE100 (acc. to DIN16961, EN13476, ASTM F894, ISO9969 and other intl. standards) are produced with an integrated electro fusion joint socket and spigot. The pipe is completely helically extruded with profiles or solid wall, tailor made for any kind of application within the standards. The pipes have no welding seams or any weak points and are completely monolithic made from high density PE100. There is no recycled mixed material used, to assure an excellent quality of the pipes which is assuring the service cycle of minimum 100 years. Most Krah pipes are produced with an integrated socket and spigot. These are adaptable to the following listed jointing technologies. As various tests and decades of experience have shown, the jointed part of a pipe system is usually the most vulnerable part. Here, the pipe is mostly exposed to possible leakages. The Krah system offers a well-known connection method developed further for large scale application which eliminates these concerns by guaranteeing a solid homogenous pipe line. Manholes are used for maintenance and inspection of piping systems. Basically they can be clustered into two main categories. System shafts are used for smaller dimensions whereas tangential shafts are used for rather larger dimensions. They basically differ in their position/location towards the pipe. All Manholes are designed in a cylindrical shape. They are designed to take full highway traffic load (HLC60) where the reinforced concrete top plate rests directly onto the vertical wall of the construction. PEHD Manholes and chambers can also be installed in areas of high ground water levels. If requested all pipes can be manufactured either with a bright, inspection friendly or an electro-conductive inner surface made by the co-extrusion process. of pipes outside for a long time). 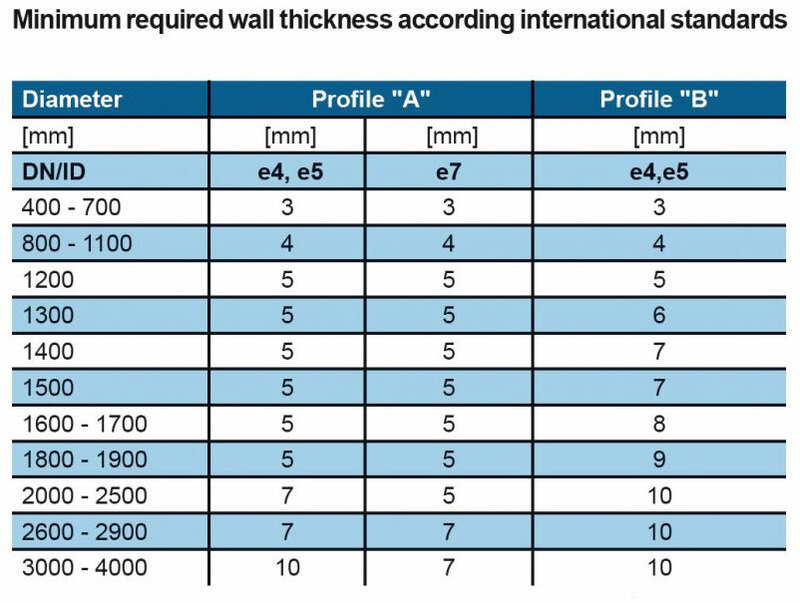 internal diameters (ID) ranging from DN/ID 300mm to DN/ID 5000mm. Elastic pipes can react to changes in their environment. to its surroundings and the force acting on the pipe will be diminished. systems already show damages like breaks or cracks. absolutely resistant against infiltration and exfiltration. pipeline. Krah pipes are nearly unaffected by temperature variations. advantages to other pipe materials like concrete, steel, ductile etc. ends, the pipe will go back to its initial condition and position. they are also suitable for road construction. Due to the smooth anti-adhesive inner pipe surface the inner diameter and hydraulic properties of Krah pipes will remain constant regardless of the wall thickness or the profiles. diameters can be used, which means that costs for material and installation can be reduced significantly. The Krah pipe system can withstand low working pressure up to 3 bar, depending on the thickness of the waterway wall (e4,e5). 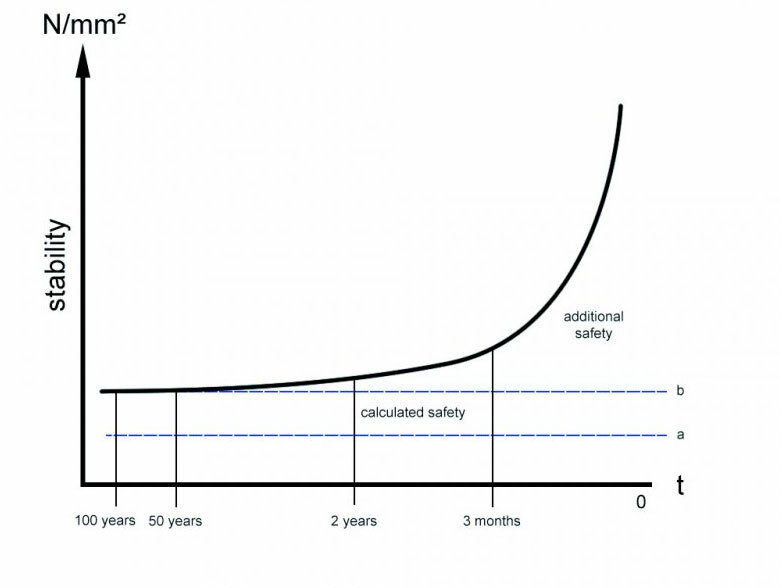 the minimum wall thickness of the waterway for A2 pipes. The standard laying length (L) of the Krah pipes is six meters, because in this way they are easy to handle, store and transport. In addition it is possible to continuously produce any length between one and six meters. The longer a pipe is the fewer joints are necessary and this is advantageous for the pipe installation. Moreover it is possible to deliver the pipes already jointed, whereat the installation time on site can be reduced significantly. pressure application is 100 years. Basically every component is designed for a 50 year full and constant load case. you have the extra safety again. Polyethylene (PE80 and PE100) and polypropylene are thermoplastics with excellent properties for the application with water and sewer, as well as for the fabrication of containers for liquids and solid materials. These materials feature the properties mentioned in the table on the right side. 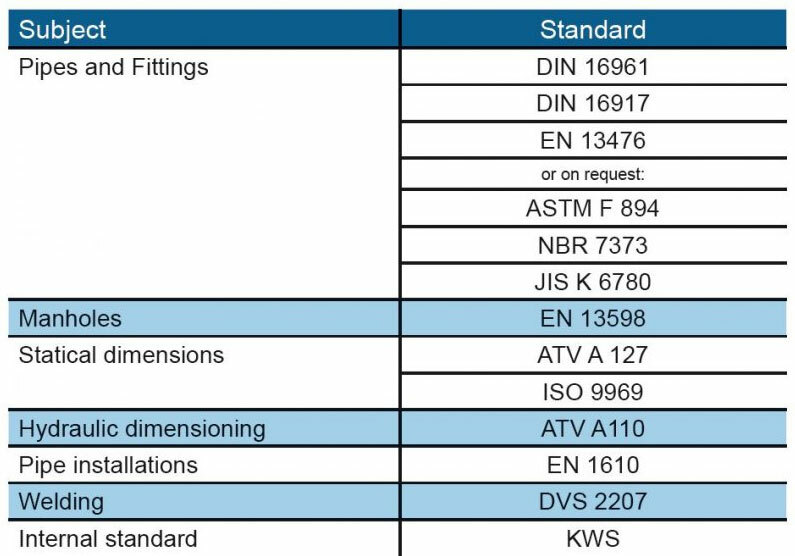 have the specifications listed in the table below. Both profiled and solid wall pipes with wall thicknesses of up to 300mm can be produced. The quality of the pipe is highly dependent on the quality of the waterway wall, therefore all Krah pipes are usually produced with a minimum waterway wall of 4mm. The Krah pipe system is designed to meet the requirements of present applicable international norms and standards. The Krah Pipes GmbH & Co. KG is member of the major standardization committees to guarantee that the pipes are corresponding to the standards, but also that the standards are corresponding to the pipes. According to different norms and standards, the pipes shall be designed according to nominal ring stiffness classes. (SN) like SN2 (only for pipes DN > 500), SN4, SN8 or SN16 (according to ISO 9969), or other standard stiffness classes (DIN16961, ASTM F894, NBR 7373 etc) not depending on the testing method (constant speed or constant load). In addition, according to EN13476-3 (9.1), the manufacturer is also allowed to produce pipes DN/ID > 500mm in between the SN classes, in case he is able to prove and underline this decision with the help of a static calculation. According to CEN/TS 15223, piping systems of stiffness classes ≥ SN 4 ,designed to be used underground, are sufficiently resistant to external water pressure. 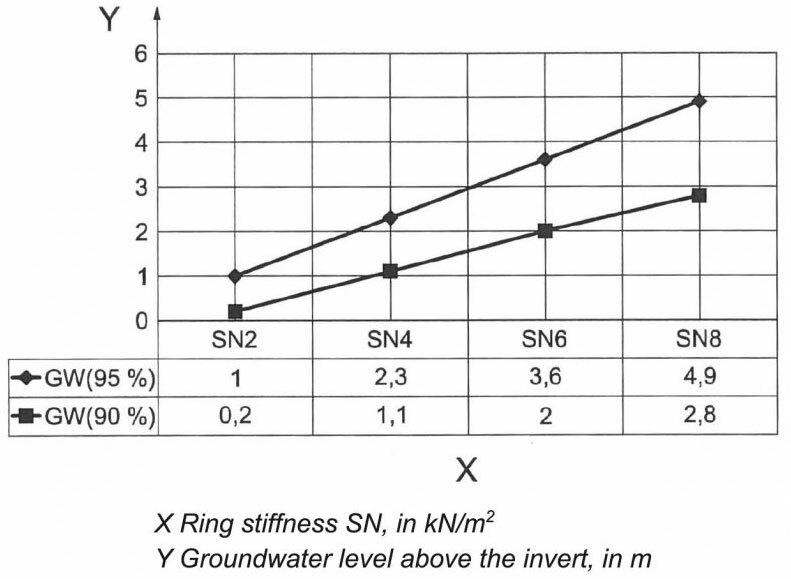 More stringent requirements with regard to external water pressure can be checked in diagram 2 as a function of the ring stiffness of the pipe. Do you have any questions or would you like to be advised on one of our products?